For the sake of argument, let’s say you’re shopping for a new watch. You buy a watch and you enjoy it for a couple of days soaking up the compliments of how it looks on you. Then you’re surfing the web one day and you come across an ad selling the same exact watch you just bought for HALF the price! What?!?!! So my suggestion in this article comes from my attempt to put myself in your shoes. If I was in need of a credit card terminal and was faced with the option to lease or buy, I would want to know the reason(s) why it is not a good idea to lease a credit card terminal. No one likes paying double or triple the fair market cost of ANY product or service so would you think it’s crazy if someone asked you to pay 31 times the cost of a credit card terminal? That’s right. 31 times the cost! Typical terminal leases last for 36 or 48 months. The typical monthly payment of a terminal lease is $59 to $99 per month. So the total cost of a terminal lease is $4,752.00 over the life of the lease as indicated by the calculation above. Credit card terminals usually cost anywhere from $150 to $400 to purchase. With a purchase of course, you don’t owe any monthly payments. So if you compare the cost of a purchase to the cost of a lease you will end up paying 31 times the price you COULD pay for a credit card terminal if you lease instead of simply buying the terminal outright. With purchasing, you still have to consider the replacement cost that could present itself if the terminal breaks or malfunctions but it’s still better than the total cost of leasing. If reason # 1 wasn’t enough for you here’s a couple more things to keep in mind regarding terminal leasing. 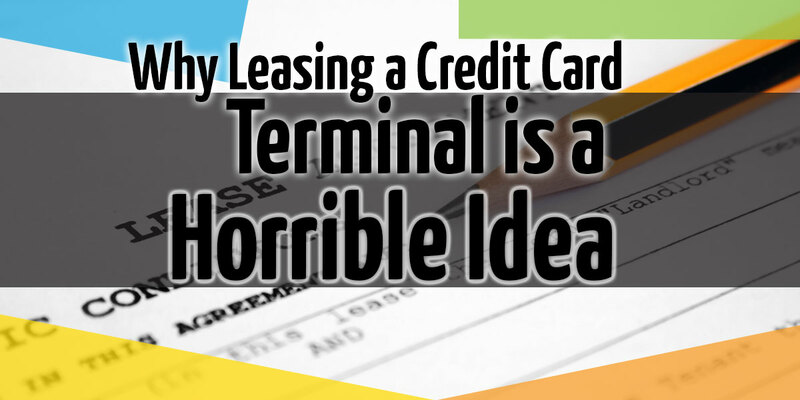 A terminal lease is non-cancellable, and there are no exceptions. None. This is the part of the terminal lease that is most often misunderstood and unfortunately often misrepresented by the merchant account sales representative. If you are entering a true terminal lease, you will be required to satisfy all of the monthly payments before you are able to terminate the lease and stop making payments without penalty. If you have been presented with a terminal lease read the fine print specifically looking for non-cancellable lease terms. The alternative usually involves stopping your payments mid lease term and then hiring an attorney and fighting the leasing company in court. That means lots of legal fees and dings on your credit. First, if you willingly and knowingly signed the lease agreement you’re not going to be able to cut it short. Again, the only way to properly get out of the lease is to pay the lease in full. If you feel you were mislead when signing the lease contract you can always seek legal advice on best courses of action. More often than you would like to know, business owners all across the country sign terminal leases and pay exorbitant monthly payments. Some even up to $150 per month for a 48 month term. It is like pulling teeth to get a leasing company to agree to stop charging you for a terminal lease that was legally entered into. I have witnessed businesses who have gone to court and paid thousands of dollars in attorney fees to get out of a lease that would eventually cost them over $10,000 upon completion of the lease term. Outside of the financial cost, these business owners paid hours of their precious work days accompanied by headaches and worrying about whether or not they were going to get out of that dreaded $150 monthly payment. I have been in the merchant account business for over 9 years now, and I have never asked a business owner to sign a terminal lease. As I have illustrated, terminal leases are a bad idea and from a financial standpoint it does not make any sense to lease vs. the other options you have. Find a payment processing company that you can trust and if you have been offered a terminal lease, run the other way. As I’ve mentioned before, I like let my work speak for itself, so read what others have to say about my service and sign a contract with a processing company that values customer service. Click on the Book Icon to the right of this post and download the report which gives you some of the most common Merchant Account Mistakes made when entering into a contract with a provider. A much better alternative to terminal leasing or purchasing terminals is to take advantage of a terminal placement program. Moral of the story: Never, ever, lease a credit card terminal!